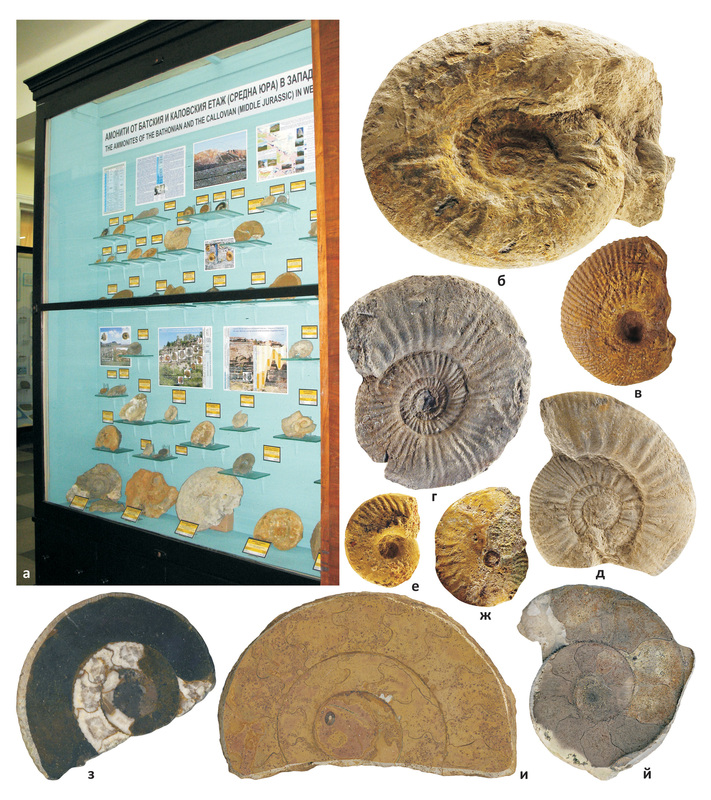 An exhibition 'Ammonites of the Bathonian and the Callovian (Middle Jurassic) in West Bulgaria' was recently completed and is now available for visitors in the Palaeontology Hall of the museum. Specimens of 30 species and 15 genera of Bathonian and Callovian ammonites from the families Phylloceratidae, Lytoceratidae, Oppeliidae, Tulitidae, Sphaeroceratidae, Morphoceratidae and Perisphinctidae are shown. They come from different levels of the Bathonian and Callovian ages, and reflect changes in the composition of the ammonite sequences over time. Graphic details and on-site photos of the examined slices complete the exhibition. The realisation was made possible thanks to the financial support of the Foundation 'Asen Nikolov'. The exhibition is dedicated to the 80 years anniversary from the birth of the talented Bulgarian palaeontologist Yuli Stefanov (1932—1966) — founder of the modern research on the Bathonian ammonites in Bulgaria, whose brilliant publishing activity is interrupted by his unfortunate death.